Project of Ecological, Aesthetic and Civil Education in Primary schools in Russia. The Project aims at the inculcation in secondary school students of ecological thinking, aesthetic and humane attitude to nature and society their adaptation to the environment, their involvement in cooperation and action aimed to the protection of the environment. This Project has been carried out during five years in Gymnasium 1532 and Jewish school ¹ 1311, Moscow, with the traditions, customs and culture of the Russian and Jewish peoples taken into account. The motto of the Project is: " In imparting to the pupils the necessary knowledge I strive to cultivate in them love of the environment". With nature and human nature being in separable, ecological education should be incorporated in aesthetical education, which is the basis of our project. Ecological education is of primary importance in junior school when the child's soul and mind are open to knowledge and emotional sensations, when the basis of upbringing, education and culture are formed. Love of nature is to be inculcated in the child at an early age to help the child realize the beauty and harmony of the environment and develop in the child a tender attitude towards all creation. The pupils to be taught to understand the interaction of all parts of the creation , the role of the human being in safeguarding the life of other beings, the role of man in protecting the environment. Emphasis is placed on the aesthetics of the environment, to demonstrate its beauty and harmony which are a source of poetry, art and music. When carrying out the Project in Russian and Jewish schools great attention is paid to the traditions, customs and culture of the Russian and Jewish people, their moral and ethical principles. All the contributes to the pupils developing a considerate approach towards nature, humane attitude to the environment and society. The key factor in the educational process imparting knowledge are emotions, the pupils are made to comprehend nature through creative work, by means of art and elements of aesthetics. · Use of artistic means at the lessons ( fine arts, music, poetry, drama) . · Participation in traditional festivals, associated with the environment. · Visiting various Moscow museums illustrating the subject of the lessons. · Children’s practical activity aimed at the environment protection. The given project pays great attention to the protection of the environment and ecological enlightenment of the pupils, in order to transform their acquired knowledge into a way of life. The Project consists of three inter-related parts: EDUCATIONAL, OPTIONAL (extra-mural lessons), and ENVIRONMENTAL - PROTECTIVE. The Educational Part of the Project constitutes an integrated educational course comprising subjects provided for by Russia’s schools curriculum, such as "NATURE SCIENCE" and "ENVIRONMENT" with an ecological component part included. Section1: "OUR INTER-RELATED ENVIRONMENT" envisaged for children of 7-8 years age. It includes ecological- aesthetic ideas about the environment, the notion of animate and inanimate nature, their interaction and the natural ecosystem. Inanimate nature is treated as environment of inhabitancy and basis of life of animate nature. Included are topics connected with the aesthetics in the popular tradition. The role of nature in human life and the role of the human being in the life of nature is studied . The pupils are taught to understand the necessity of the protecting of the environment. Section 2 : "THE NATURE OF RUSSIA" envisaged for children of 8-9 years of age. It includes ecology-aesthetical ideas about the nature of our continent, in particular, Russian nature. Ecosystems of forests , meadows, marshes, etc., food chains in ecosystems are studied. The pupils are introduced to the consequences of human interference in the environment, its protection, and the role of the popular tradition in environment protection. Section 3 "OUR HOME IS THE PLANET EARTH" envisaged for pupils of 9-12 years age. It offers knowledge of the universe, the unique role of the planet Earth and the biosphere, water, air, soil as inhabitancy environment as the basis of life on Earth, the ecosystems of water, air, soil, as well as different climatic zones. The pupils study the role of civilization’s interference in the life of the "wild nature", and man’s role in and responsibility for the protection of the environment. · An ecological theater, creative art, etc. · Teaching children to make embroideries following folk motives taken from nature. The Tretyakovska Gallery, Museum of Jewish Art and Mode of Life - depict art's vision of nature. Museum "Inform-Auto": "Think about Water" devoted to the economy of water; "Museum of water" devoted to the history of the Moscow water pipe; Museum of Paleontology devoted to our pre-historic ancestors; ZOO garden , etc. participation in the International ecological Projects and etc. The final part of the project is the PROGRAM OF ECOLOGY ENLIGHTENMENT AND NATURE PROTECTIVE ACTIVITY OF THE PUPILS. · the highest water consumption in the world: 450-500 liters per 24 hours owing to the negligence and leakage of the water pipe-line accessories, etc. The children's activity is aimed at fighting the accumulation ofgarbage , saving water, and introducing the population to ecological problems, etc. This work is carried out under the motto:"Green Flagman", which is the title of our Children’s non – formal organization. 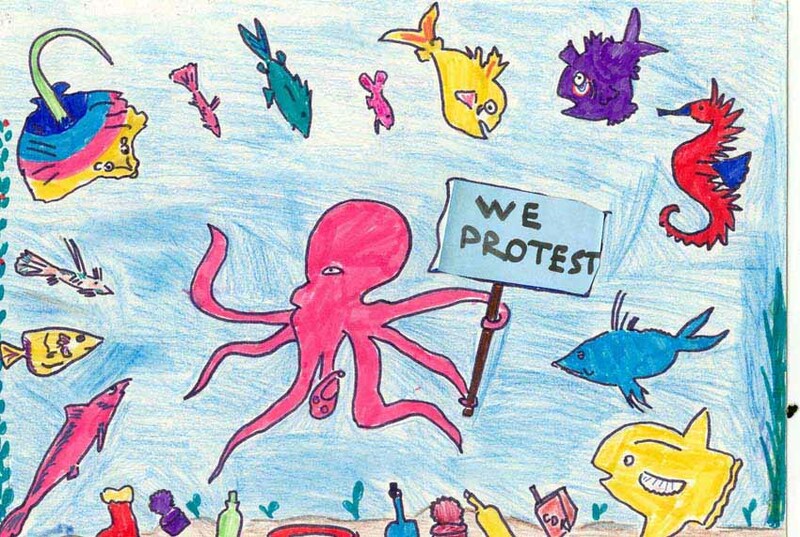 "ECOLOGICAL PROBLEMS THROUGH THE EYES OF CHILDREN". Children have contributed drawings to our exhibitions: "Save the nature of our Native land"; "Nature Needs our Help"; "I Wish my City to Look Like this"; " The Air we Breathe"; "The Water we Drink"; "The Food we Eat"; "Nitrates Surround us"; "The Problem of Garbage in our City"; "How can the Pollution of our Environment be prevented"; "What Help can I offer City?". The pupils and myself carry out simple monitoring of the environment. Ecological information sheets dealing with the ecological problems of our city, and children’s norms of behavior, are distributed in schools. The pupils are participating in ecological performances which deal with urgent ecological problems of our city. After the performance the actors involve the children-spectators in a discussion of the problems raised in the performance. The discussions are held by way of different competitions, for instance: "How can the Amount of Garbage be diminished?’ "Reprocessing of waste ", "Ways of saving water" etc. The pupils readily participate in these competitions, offering unexpected solutions accompanied with drawings. This simple of ecological knowledge is dissemination easily embraced by the children. THE INTERNATIONAL DAY OF EARTH 1999" was celebrated with ecological performance: "FAIRY TALE ABOUT A FISHERMAN , GOLD FISH AND DIRECTOR OF A CHEMICAL PLANT". It is tale about an old man who caught a gold fish that told him about the pollution of the Volga by waste of the Chemical plant and the death of all living creatures in the river. The fish requested his help. However, the old man could do nothing for he couldn’t prove to the director of the plant that the pollution of the Volga was his fault. Only children’s pickets against the pollution of the Volga saved the river and its inhabitants. The performance was accompanied songs, dances and jokes. It ended with a dialogue between the actors and spectators about the problem of the Volga pollution and the water supply of Moscow from the Volga and health of our people. Herein are presented ideas of a complex ecological education of pupils , aged 7-12, for primary schools. The Project was been successfully carried out in the course of 5 years at Gymnasium 1532, and Jewish School 1311, Moscow.The ecological education of pupils coupled with their ecological activity aimed at the protection of the environment, permits the inculcation in them of ecological thinking , which contributes to the transition of their ecological knowledge to a system of behaviour. I’d be happy to cooperate with teachers of Canada and other countries in the field of ecological education of junior pupils, and to have this Project introduced in different schools.